The time has finally come for me to announce our first DIG opportunity!! First, let me remind you about what this is. DIG is a monthly opportunity to answer 10 Bible Question for a chance to win lunch, coffee, or ice cream with ME! These questions will challenge you to DIG through the Bible to find answers. The first THREE Cleveland MS or HS girls to respond in the comment section on this blog (must be on this blog site, not facebook, etc.) with all 10 correct answers will then win a "date" with me, and must schedule it before the end of the month. We will have a DIG opportunity once a month, so always check the site for the next posting! 1) Of the 10 commandments, what is the 3rd commandment? 2) What did God appoint to destroy the plant that was giving shade to Jonah when he left Nineveh? 4) What does Isaiah 26:4 say? 5) When Ruth and Naomi arrived in Bethlehem, what did Naomi ask the people to call her instead of her name and why? 6) In the parable of the talents (Matthew 25) what did the one who was given only one talent do with it? 7) In that same parable (Matthew 25) what did the master say to those who had gained additional talents from what they had been given? 9) Name all 9 of the fruits of the Spirit. 1) You have one week left to sign up for the girls retreat! Please help us plan the BEST retreat for you by signing up this week. Lots of planning goes into a retreat, so the sooner we know to count on YOU, the better! I so hope you can join us! It's going to be so much fun! 2) We had SUCH a fun first round of MNM nights with the Middle School girls last night! We met at Ms. Pandy's home and learned about Biblical femininity in the home. Ms. Pandy taught from Proverbs 31 and really emphasized verse 30, "Charm is deceptive, and beauty is fleeting; but a woman who fears the Lord is to be praised." It is also my prayer that our girls seeks to have pure hearts that are in awe of our Lord before their concern for theirs looks and wit. Ms. Pandy along with some of our other great moms then taught all 20 girls how to make pumpkin chocolate chip cookies (um, YUM) and how to sew on a button! Such valuable life lessons! 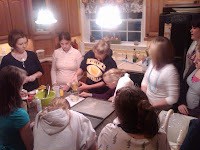 The girls had a great time and cannot wait for our next meeting on November 30th at Ms. Tammy's home! **High School girls...have no fear you will be learning and doing all this fun stuff at your Sunday Night Makeover at Ms. Megan's home. November 8th from 4-6 PM. 3) Last but not least, I had promised picture from our Girls Ministry Launch. Man, what a great night we had! Enjoy the pictures and leave a comment about what you are most excited for in Girls Ministry this year! We have one winner so far! Just so you know, I am not going to post your answers until all three girls who enter correct answers have won! Let's go girls! 1.You shall not make for yourself an idol. 3.Trust in the Lord forever, for the Lord, the Lord is the rock eternal. 5.Mara, meaning bitter because she believed the Lord had dealt bitterly with her. 7.well done good and faithful servant you have been faithful with a few things I will put you in charge of many things. Come and share your masters happiness. 9.Love, Joy, Peace, Patience, Kindness,Goodness, gentleness, faithfulness, and self control. 1) You shall not misuse the name of the Lord your God. 4) "Trust in the Lord forever, for the Lord, the Lord, is the Rock eternal." 5) Mara, because the Almighty had made her life very bitter. 6) He dug a hole in the ground and hid his master's money. 7) He said, "Well done my good and faithful servant! You have been faithful with a few things; I will put you in charge of many things." 9) Love, joy, peace, patience, kindness, goodness, faithfulness, gentleness, and self-control. 1) “You shall not take the name of the Lord your God in vain, for the Lord will not hold him guiltless who takes His name in vain. 4)Trust in the LORD forever, for the LORD, the LORD, is the Rock eternal. 5)Mara. she said God has made my life very sad. I've been waiting for this!!!!!!!!!!!! 1)You shall not missuse the name of the Lord. 4)"Trust in the Lord forever, for the Lord, the Lord, is the Rock eternal." 5)Mara, which means bitter, because "the Almighty has made my life very bitter". 6)He dug a hole in the ground and hid the talent. 7)"Well done, good and faithful servant! You have been faithful with a few things;I will put you in charge of many things. Come and share your master's happiness." 9)Love, joy, peace, patience, kindness, goodness, faithfulness, gentleness, and self-control. p.s. I couldn't figure out how to sign in or put a profile or URL name.....so I had to put anonymous and just sign my name in the end. What should I do to sign in?